Stitch-School were thrilled to be invited by the Barbican to take part in Make! Season of Contemporary Crafts 17th - 25th March 2018. We installed our two and a half meter embroidery table with the A-Z linen Supper Cloth stretched ready to stitch. 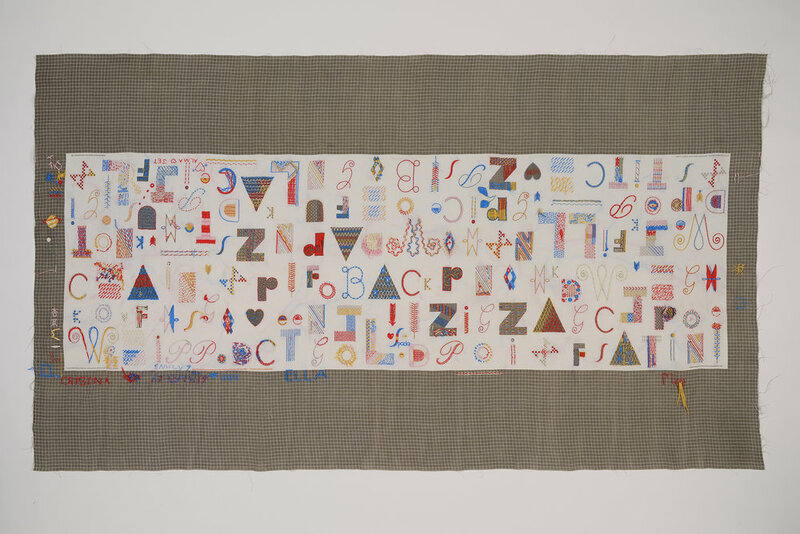 Each letter represents an individual stitch and an over all word search of embroidery stitches to explore - 'slip' 'back' 'whipped' 'chain' 'run'. The Supper Cloth was resident in the Barbican shop for over ten days inviting the public to take part in stitching the cloth. We calculated over 300 hours of embroidery by 100 participants over the period of ten days with ages ranging from three years old to senior pensioners. It was fantastic to see participants enjoying the art of stitching alongside the satisfaction of working together to create this beautiful communal cloth. Many conversations and stories of textiles took place whilst stitching with some visiting the cloth several times. It provided an opportunity to slow down and study stitch as a mediative and social activity. The final master piece is now on display in the Barbican shop until June 2nd, we would love Supper Cloth to go on tour as is an amazing example of a large embroidery sampler showing a fascinating exploration of stitches through, play, study and the connectivity in communal making. Time lapse film here and more images here. Stitch-School has no rules with embroidery, participants can reference traditional stitch structures with our educational booklet or explore an experimental and playful approach resulting in characterful and expressive embroidery. Working collaboratively people learn from one another to create a 'joined up' dialogue through embroidery gaining inspiration from one another. The cloth becomes a live teaching tool, a collective piece which explores the narrative of stitch resulting in a massive sampler for future reference. The Supper Cloth attracted lots of lovely folk with many children learning how to embroidery for the first time, Harry age 7 yrs came back three times to finish his letter 'this is better than Minecraft'! Lovely Fran came back several times becoming our resident helper, our youngest stitcher was three years old! Watch our time lapse showing the Supper Cloth in full activity. Thank you for DMC embroidery threads for sponsoring the Stitch-School Supper Cloth and providing five fantastic cones of colored thread! 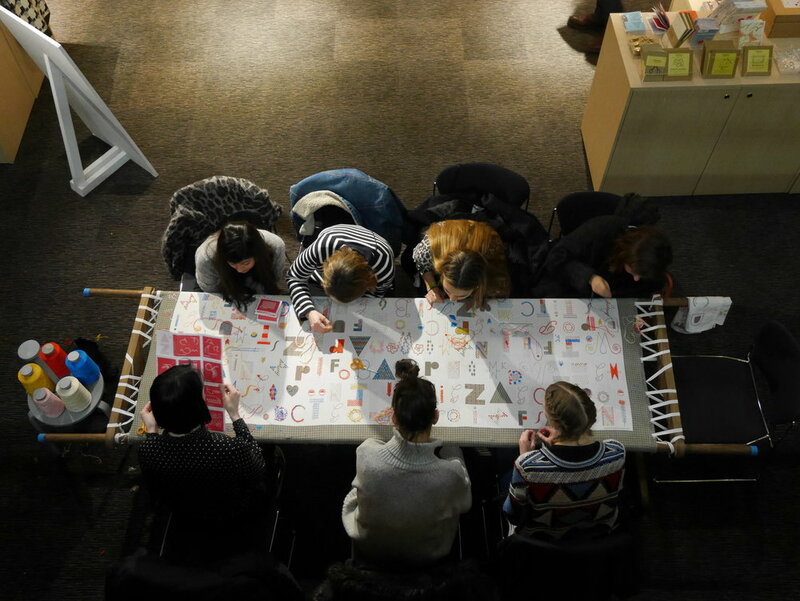 You can also find our A-Z embroidery kits on sale in the Barbican shop!